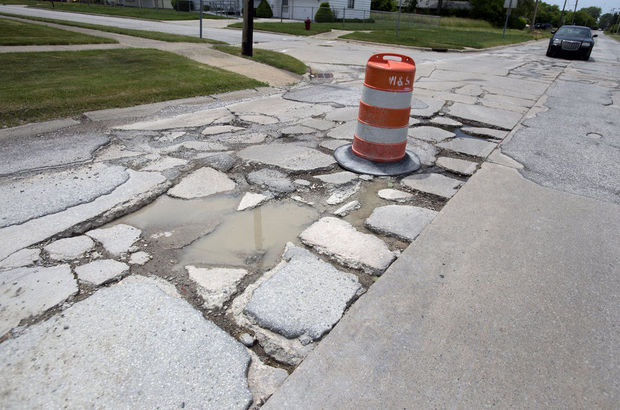 Counties with the worst roads in Michigan were just as likely to soundly reject Proposal 1 as those with relatively good ones. Here is a county-by-county look at road conditions; hover over a county to see how it voted on Tuesday. Counties were ranked 1-83 in order of percentage of poor-quality roads, with No. 1 having the best roads and No. 83 the worst. Source: Michigan Transportation Asset Management Council. The defeat of Proposal 1 left observers groping for appropriate language – wipeout, thumping and, perhaps inevitably, roadkill. But this was no hyperbole. Proposal 1, which would have raised the sales tax 17 percent while simultaneously changing the way fuel is taxed and making numerous other changes in state law and its constitution, wasn’t just rejected by voters, it was rejected with extreme prejudice. And the rejection bore no relation to road conditions in individual counties. Rejection of the roads measure also flouted political assumptions. It was crushed 81-19 in heavily Democratic Wayne County, where President Obama got his biggest victory in 2012. And it was defeated 77-23 in Ottawa County, the most Republican county in the state and where Gov. Rick Snyder – Proposal 1's biggest supporter – got his biggest win just a year ago. The only glimmer of correlation between road quality and results – and it is a faint and perhaps surprising one – was in Kalamazoo, where roads are among the state’s best, and yet Proposal 1 got 32.7 percent “yes” votes, third-highest in the state. These maps shade the state’s counties by road quality and voting results. Hover over each county to see how each voted and the condition of its roads. No county in the state supported Proposal 1. Here is a county-by-county look at the levels of opposition; hover over a county to see how it voted on Tuesday. Source: Michigan Secretary of State. Data presentations by Mike Wilkinson from various sources. I am not against increasing my taxes for roads. I just want to know that the money will be used for roads. Come up with a simple ballot proposal that is transparent and easily understood. We need more focus on what policies/laws/decisions failed to maintain our infrastructure. Quick fixes are becoming the norm and are one of our biggest problems. They are short and to the point but do not keep the same problem from happening again. Don’t propose a quick fix without 50% addressing changes on how we do business. The funds generated can be earmarked/targeted/promised/restricted to get the roads fixed but what can be done to improve the way we do business, promises ONLY? Doesn’t work. We have elected these folks to, "think outside the box", and the lack of anyone to bring up the 2 ton elephant standing amongst them is evident they seem not to be serious about resolving this revenue issue; not just for roads either. The last poll taken, state wide, there is above an 80 pecent support for legalization of Marijuana (taxes folks). We as citizens need to hold our elected officials accountable and do their job; making commonsense decisions. This really is a "no brainer". Stop arresting potheads and tax marijuana like Colorado to fill potholes while increasing the gas tax for those Cadillac Escalade owners who obviously don't mind paying more for gas. As I recall, Colorado raised $50 million from marijuana taxes. This outcome was totally predicted. The poll predicted, and everyone in business and socially with whom I discussed Proposition 1, supported a "yes" vote for a straight forward 'Highway Improvement Proposition' without all of the extraneous baggage! From where will the money come when a budget shortfall appears on the horizon and there is no solution to fix it. I am sure that in the back of the legislators minds if Proposal 1 passed funds from the new taxes could be used to shore up the budget. If our friends in Lansing try a Brownback Kansas solution, it might not go down very well with the folks here in Michigan. It is time for a Constitutional Amendment creating a progressive Income tax on individuals as well as corporations and raising the gas tax to $0.30 a gallon. This is a rational solution to Michigan's budget problems. I am sure this is the furthest thing from our legislators minds. Maybe they can get an emergency manager.